Rey Cometa and Angel Azteca were replaced by Pegasso and Molotov. First loss for Magnus, who used a La Mistico like move for a pinfall during the match. Straight fall wins for the vet, after Demus fouled him in the first fall. The list of stips so far for their big match: hair vs hair, loser is a mini, winner owns the Cancerbero, Virus must kiss Demus' hand if he loses. Demus is asking the fans to demand the match take place at Dos Leyendas - it still has no date. 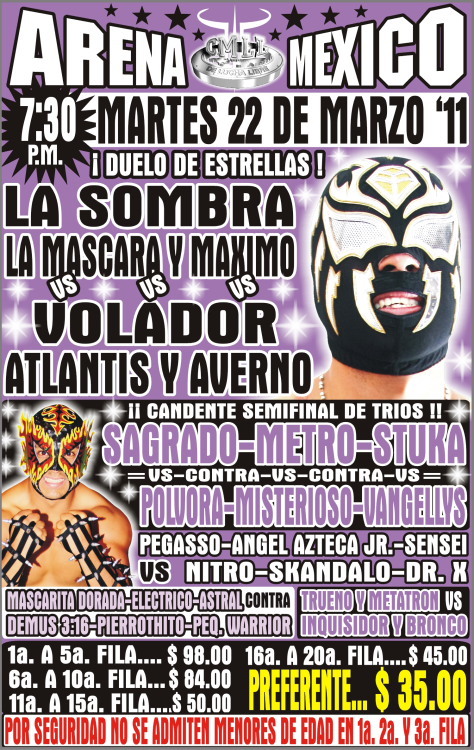 Volador replaced Averno, Fantasma replaced Metro. Volador won, destroying Stuka along the way. 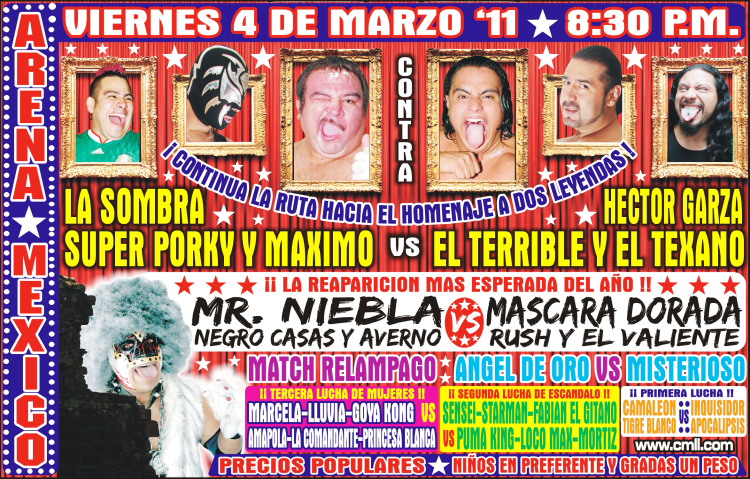 Volador has gone from feuding with Mistico to Super Porky to Stuka. If this doesn't catch on, maybe he can go after Bengala? Ultimo Guerrero beat La Mascara with his own campana (again! ), then demanded a shot at the Mexican National Light Heavyweight Championship. 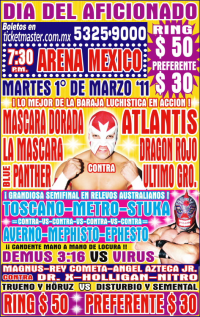 La Mascara agreed, provided he gets a shot at UG's CMLL Heavyweight Championship if he wins. Upset! Mistersioso used the ropes to stay on top for a pin at 7:43. Angel de Oro protested vociferously after the match. Straight fall win. Porky did a plancha off the stage to start the match. He later fainted during the match, and was checked by the doctors the rest of the time. Twitter thought Porky had a heart episode, but nothing's mentioned about it in their recap. Valiente beat captain Garza in the first, and Texano fouled Maximo in the second. Niebla snuck in a foul on Sombra in the the third for the win in his return match. Averno took both Dorada & Sombra's masks after the match. Event Notes: Felipe Ham Lee was honored before the lightning match. It began to rain outside - and the rain seeped in from the ceiling for a while during this match. That'll be fun. Not fun: Angel de Plata is doing his shooting star press to the floor in every match, and there was no one to catch him this time. (Escorpion and Bronco were there.) Plata was out of the match after that, and CMLL says he has a back bruise Tiger Kid eliminated Metalico, but was caught by a surprise Leono armbar for the pin. With the other four out of action, Bucanero and Zacarias tried to foul Maximo and Monito, but the tenicos blocked it and kissed the rudos! Maximo then pinned UG with his feet on the ropes. A fine day for Maximo. Sombra, with a hurt left elbow, still beat Mephsito to keep the trios titles. Said to be the best match on the show. Sombra challenged Mephisto to put up his title in a singles match. Nitro was UG's second, Brazo de Oro seconded his son (which kind of gave away he was winning.) Ultimo Guerrero went for the campana again, but Mascara escaped and applied his own to keep the title. Semental accidentally dropkicking Disturbio led to the loss. Escorpion powerbombed Sensei for the deciding pin. Virus withstands everything Demus has to beat him. Good match, though the Friday crowd wasn't as much into it because it had been built on Tuesdays. Straight falls. 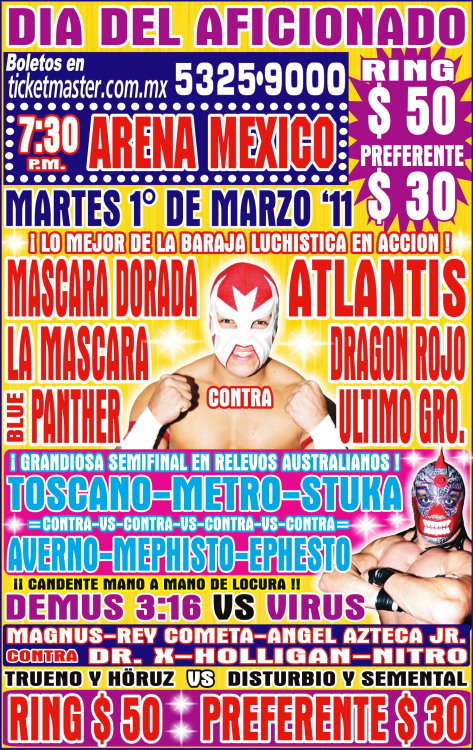 Averno DQed in the first for unmasking Dorada, Dorada cradles Averno for the second. Veterans won, but not without some controversy. First two out were Zavala (Mortiz spanish fly), Hombre Bala (Rayo II), leading the rookies down 4-2. Signo & Lee eliminated Mortiz, but then Signo fell next. That left Rush's brother versus both Tapatios and Inquisidor. Dragon Lee spectacularly eliminated Inquisidor with a SSP. Tapatios started using rudo tactics on the young tecnico, but Lee still beat Rayo I. It looked like he might get Rayo II as well, but Inquisidor got involved, and Rayo II stole Dragon Lee's mask to set up the winning cradle. Rudos took the first, tecs the last two. Sagrado and Okumura continue to feud. Cuije and Zacarias fought during this match. Looks like Niebla and Felino won it clean for their team. Tecnico won the first, rudo won the second, tecnico won the third. Springboard flip 'rana (Dragonrana) for the win in about 30 minutes. 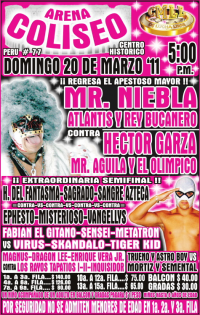 Virus replaced Nitro, beat Cometa in the deciding fall. La Mascara had Olimpico in a campana, and Volador ripped his mask off for the DQ. Astral replaced Bam Bam. Rudos took the first. Tecnicos took the last two, winning the third via dives. Astral looked bad in the clip on radiocmll.com. Tecnicos took the first, Euforia ripped off Stuka's mask for the straight fall loss. Tecnicos brought a Fabian el Gitano shirt to the ring and pointed to the sky. Luchadors filled the ring for a moment of applause for Fabina el Gitano after the match. Rudos took the first, tecnicos took the second, rudos took the third - while Valiente dove on UG, the other two tecnicos ran straight into Atlantidas. Angel Blanco's family was honored after the match. Horuz unveiled a new mask, resembling his grandfather's mask. It appears he'll be sticking with the Horuz name. Toscano was wearing a "Fabian" armband. Tecnicos took the first, rudos the second, Niebla legdropped Monito in the third, Sombra hit a big tope, minis brawled, and the rudos took it. Dorada's fireman's carry powerbomb in the first, Devil's Wings in the second. Long third fall, with Mephisto tripping Dorada up and Averno sneaking in a foul for the win. Black Warrior, reintroduced to the crowd before the match, attacked Averno and unmasked him after this match. tecnicos won the first fall in seconds, rudos won the second, though only after nearly being beat by a Porky splash. Two different dive sequences in the third fall. Maximo eliminated Terrible and Texano eliminated Porky at the same time. Texano escaped the kiss cradle (thanks to Terrible distracting the ref) and dropped Maximo with Tornado Texano for the win. 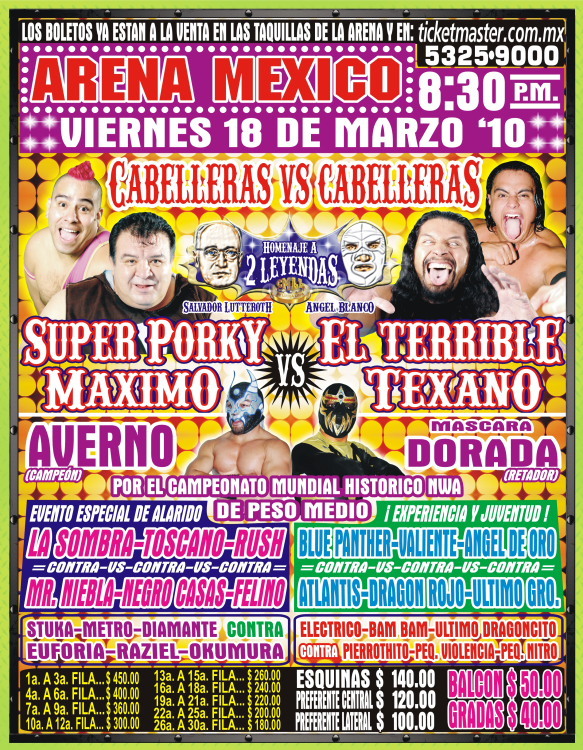 Maximo and Porky got shaved in the ring, with many of their CMLL family members (Robin, Goya, Brazo de Oro, La Mascara I think) standing with them. Rematch from last week's cibernetico; unclear if the Rayos have switched sides on a more permanent basis. They lost in straight falls here, DQed in the second for taking Dragon Lee's mask. Tapatios are playing with fire. 4) Bird Man, Fujiyama, the Ole b Dokuronger, Love Shock, Majin Jr.
Special Kami-Robi match. Tecnicos (Fuego, Angel de Oro, Diamante) beat rudos (Felino, Misterioso, Polvora) in different gear than usual. 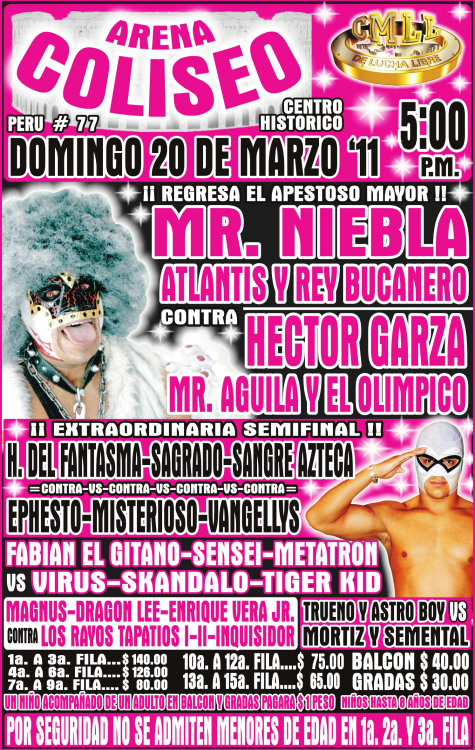 Lots of Niebla and Zacarias in this match. Demus returned to the mini division with a win. Garza replaced Averno. Atlantis fouled Sombra for the win. Goya squashed Amapola for the win. Horuz's mask looked like his old mask. And he lost. Gen2011 win in straight falls for the second straight week. With no Dragon Lee around, Hombre Bala got the honor of being fouled by a Tapatio. Rayos are unquestionably rudos in this feud. CMLL Twitter said Delta used a fujiwara armbar (on Euforia, escaping his finish) for the win, "like Princesa Sujei." She does use an armbar and she's still in CMLL, so sure. Tecnicos had Monito with them to counter Zacarias. Bucanero and Rush were the last two in, with things looking back for Rey, but he managed to get a surprise pinfall. Bucanero challenged for a title match. Rush demanded a hair match. Bucanero fouled him for asking. It does hurt to ask! Atlantis pulled Sombra's mask for the winner. Volador got in on the act and took La Mascara's mask after the match. Astral beat Pierrothito, then asked for a shot at Pierrothito's national lightweight title. That match seemed agreed on for Tuesday. Pegasso was back in action. Tuareg got DQ for putting a fire out: they pressed Fuego over the top rope. Straight falls. Polvora cut Valiente down with a dropkick for the third fall. Valiente was stretchered out, and Polvora took the opportunity to challenge for Valiente's welterweight title. Valiente was too hurt to agree, but it's a possibility for sometime the future. Mascara and Sombra pinned Guerrero and Dragon Rojo, then challenged for a tag title shot. UG offered a rematch next week, and then maybe they'll do it the week after. You'd think La Mascara wouldn't trust any open ended title match promises from Guerrero, seeing as he's still waiting for his heavyweight title shot.